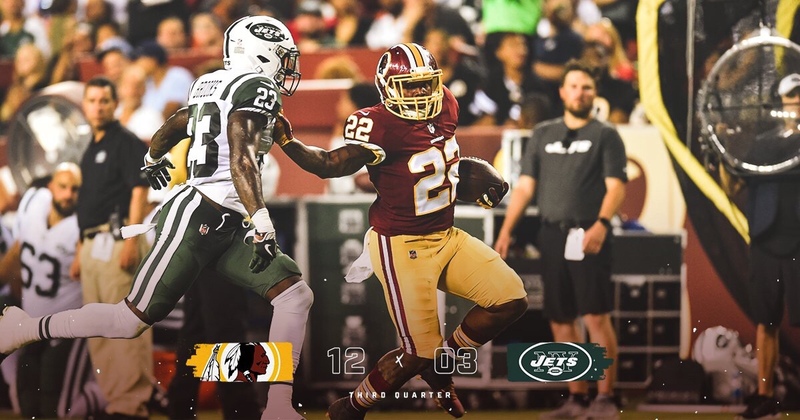 Grambling’s Martez Carter made his official preseason debut for the Redskins Thursday night against the Jets, and if you did not know his name before, you should know it now. Carter finished the game with seven carries for 45 yards, averaging 6.3 yards-per-carry. The highlight of his night came from an attention-grabbing 33 yard run to get the Redskins into the red zone. He also finished the night leading Washington’s rushing stats in total yards, and had the longest carry of the night in the 15-13 win. All in all, Carter showed up and showed out at the right time, as one more Redskins running back sustained an injury in the week two face-off. His debut performance will surely get him more attention and more reps in Week Three action against Denver. Redskins coach Jay Gruden pointed out in his postgame conference that Carter stood out in a group of backs looking to get carries.